Welcome to this week’s edition of The Friday Five! The Friday Five is a feature that I post every Friday in which I give my thoughts on a topic that’s related to NBA Live, NBA 2K, and other basketball video games, as well as the real NBA, and other areas of interest to our community. The feature is presented as either a list of five items, or in the form of a Top 5 countdown. This week’s Five is a list of five players who have appeared in more basketball video games than actual NBA games. Simply getting drafted by an NBA team, or making it onto a Summer League or training camp roster, is an achievement in and of itself. It’s further than a lot of players will make it in their basketball careers, and for those who do get that far, it’s the first step towards realising their dream of playing in the NBA. Of course, there aren’t enough roster spots available for everyone, and a lot of players will end up getting cut before the regular season begins. Some may find their way back onto an NBA roster and finally debut at a later date, while many others will not. However, while some players never get the opportunity to suit up and play in a real NBA game, they may still see themselves make it to the big time on the virtual hardwood. The default rosters in NBA videos game must be locked at a certain cut-off date, which often results in missing players out of the box, but can also ensure that players on the bubble actually end up being included. Should such a player never make it back to the league, they’ll end up appearing in more NBA video games than real life NBA games. Here are five players who did just that, whom you may or may not remember. Danilo “J.R.” Pinnock led George Washington University to two consecutive NCAA tournaments, topping the Colonials in scoring in 2006. He then entered the Draft and was selected 58th overall by the Dallas Mavericks. His rights were traded to the Los Angeles Lakers, and he played in seven preseason games for them before he was cut. Since then, he has played in Europe, Puerto Rico, and the D-League, where the Rio Grande Valley Vipers took him first overall in the 2007 Expansion Draft. Pinnock is still active and has spent most of his career overseas, but it was his stint with the Lakers that earned him a spot in NBA Live 08 PC. 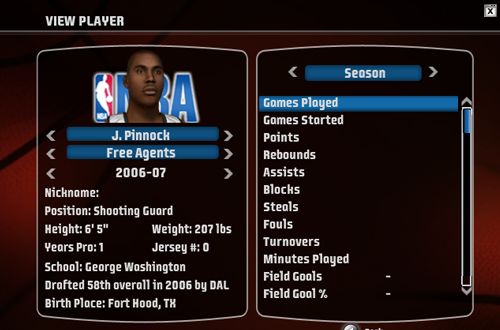 It can be assumed that J.R. Pinnock was a very late addition to the NBA Live 08 roster. He appears in the Free Agent Pool, indicating that he was left in the game after being released by the Lakers, and does not have a real portrait or face texture. Instead, he uses one of the generated rookie faces (specifically the PLYR064 texture), which is also rendered as his portrait. Pinnock uses the same generic face and portrait in the PlayStation 2 version of NBA Live 09, where he once again appears in the Free Agent Pool. As a second round pick that appeared in two NBA video games, J.R. Pinnock made it further than most. Taken 54th overall by the San Antonio Spurs in the notoriously lacklustre 2000 NBA Draft, Cory Hightower’s skill on the court was well-regarded by his peers, including former NBA player and fellow Flint, Michigan native Mateen Cleaves. His rights would be traded to the Lakers almost immediately, and despite an impressive performance for the team in the Summer League and pre-season, he was cut. After playing a year in the now-defunct Continental Basketball Association, he made his way onto the Charlotte Hornets’ training camp roster in 2001. 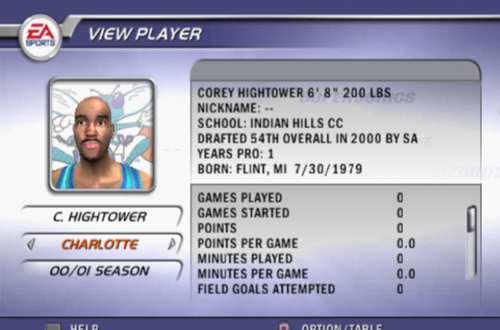 As a result, he appears in NBA Live 2002, though his first name is misspelled as “Corey”. Hightower was once again cut shortly before the season began, and he returned to the CBA, where he played for a handful of teams. The Albuquerque Thunderbirds (now the Canton Charge) selected him with the sixth overall pick in the fifth round of the 2005 D-League Draft, and he also spent time playing in Venezuela. As recently as 2010, Hightower was reportedly considering another NBA attempt, but was ultimately unsuccessful. The former Flint Pro-Am legend may not have made it to the big time, but he did have a twelve year career playing pro ball State-side and abroad, and can say that he’s been featured in an NBA video game. 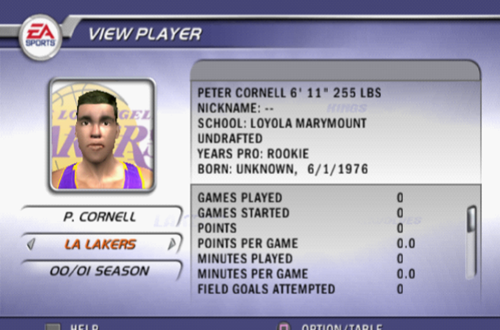 Another player with the distinction of appearing in more than one NBA video game but never actually suiting up for a regular season game in real life, Peter Cornell can be found on the Los Angeles Lakers’ roster in NBA Live 2002, and on the Orlando Magic’s roster in NBA Live 2003. A 6’11” centre that went undrafted out of Loyola Marymount in 1998, Cornell enjoyed a twelve year career playing in the D-League and overseas, but despite appearances in the Summer League and making a couple of teams’ training camp rosters, he would never officially a play a minute in the NBA. Nevertheless, Cornell remained on the radar of a handful of teams for a few seasons, signing a contract and sticking around long enough to be licensed for appearances in two NBA Live releases. Although he wasn’t on the roster long enough to win a championship with the Lakers in 2002, Peter Cornell would later find success of a different kind in Los Angeles, appearing in a handful of movies and television shows. His most famous role was probably alongside Will Ferrell in Semi-Pro, where he played “Vakidis”, the Flint Tropics’ foreign centre who doesn’t understand English. A Canadian swingman who found solace in basketball after enduring terrible tragedy early on his life, Carl English earned a scholarship from the University of Hawaii, where he excelled for the Rainbow Warriors. He declared for the 2003 Draft, but concerns about his size and athleticism ultimately resulted in him going undrafted. English was invited to the Indiana Pacers’ training camp, where his agent made the gaffe of announcing that he had signed a two-year guaranteed deal. His deal was in fact only partially guaranteed, and he ended up losing the Pacers’ final roster spot to fellow rookie James Jones, who has since won three titles alongside LeBron James. 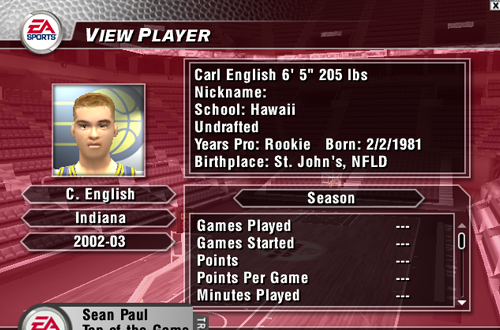 However, he was under contract with the Pacers long enough to be included in NBA Live 2004. Although English has never played an official NBA game, he subsequently received a tryout with the Seattle SuperSonics in 2004, and also spent time in the D-League. He then took his talents to Europe, where he carved out a lengthy career playing for several teams in various leagues. English is still active today, playing for Alba Berlin (though he does not appear on their roster in NBA 2K17), and has represented Canada in international competition as recently as 2015 at the Pan American games, where he helped them to a second place finish. The youngest and most recent example on this list, Terrico White was a second round Draft pick (36th overall) of the Detroit Pistons in 2010. A three-time All-State pick and three-time finalist for Class AAA Mr. Basketball in high school, White was also named an All-American and the Southeastern Conference Freshman of the Year while at the University of Mississippi. 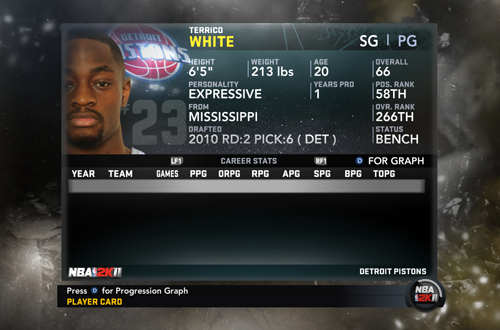 Considered to be a fundamentally sound and athletically gifted combo guard, the Pistons promptly signed him to a contract after drafting him, and he was subsequently included in NBA 2K11, with an Overall Rating of 66. Unfortunately for White, he fractured his right foot in a preseason game against the Miami Heat. Although he remained on the Pistons’ roster for the entire 2011 season, he would not appear in any games in what was set to be his rookie campaign. He was cut in December 2011 after the lockout ended, and has spent the last five years in Europe and the D-League, also having a brief stint with the Phoenix Suns in 2015 before being cut during the preseason. Having recently turned 27, Terrico White still has a chance to make it to the NBA. As of this writing however, his appearances in NBA video games outnumber his appearances in official NBA games one to zero. Do any of these players ring a bell? Can you recall any other players who made it into an NBA video game or two, but never played a minute in the league? Sound off in the comments section below, and as always, feel free to take the discussion to the NLSC Forum! That’s all for this week, so thanks for checking in, have a great weekend, and please join me again next Friday for another Five. I still remember Carl English and Terrico White in those games. I was hoping that English was on Alba Berlin’s roster in NBA 2K17 as that would’ve made for an even better footnote to his inclusion on the list, but I’m guessing he signed after the rosters were finalised.